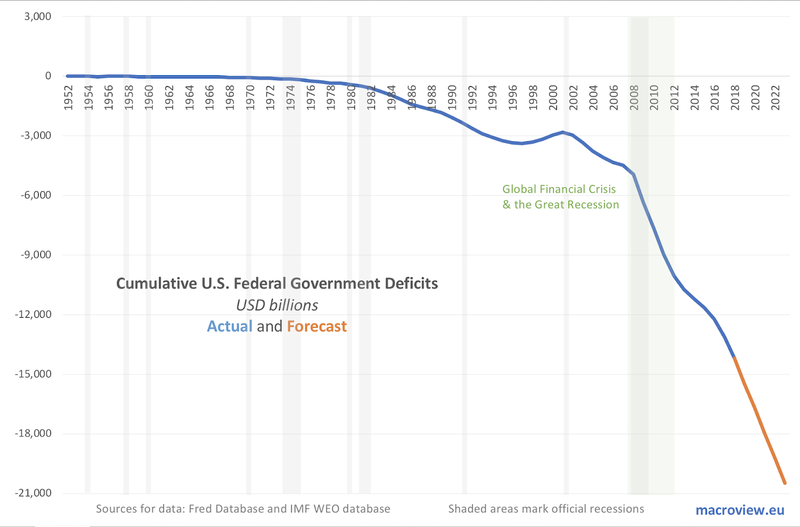 Based on the most current projections, by the end of the year 2023, the U.S. is on track to increase cumulated deficit from USD 12.227 trillion at the end of 2016 to USD 20.466 trillion. This would imply an average annual uplift of USD 1.177 trillion, which is significantly higher than the average annual increase in deficits of USD 838.3 billion recorded over the 2009-2016 period. 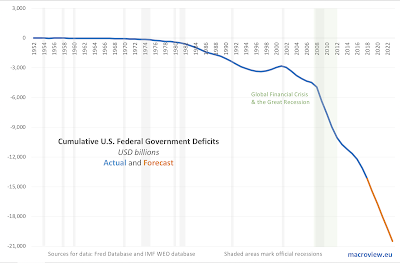 The good news is, fiscally responsible, financially conservative, taxpayer interests-focused Republican Party has given full support to the Trump Administration on what in fact amounts to a restoration of the peak crises period trends in deficits accumulation. In the first post (see above) looking at the broader measures of unemployment and dependency ratios, recall that CSO publishes several extended series for broader unemployment rates. The official unemployment rate at 1Q 2018 stood at 6.4 percent (well within the pre-crisis historical range of the average of 5.31 percent and the 99% confidence interval of (3.70%, 6.92%). In more simple terms, statistically, the current official unemployment rate is indistinguishable from the average rate prevailing in 1Q 1998 - 4Q 2007. Which is the good thing, implying that in official terms, Irelands economy has recovered from the crisis at last. In fact, the recovery in official terms has been attained in 4Q 2017. 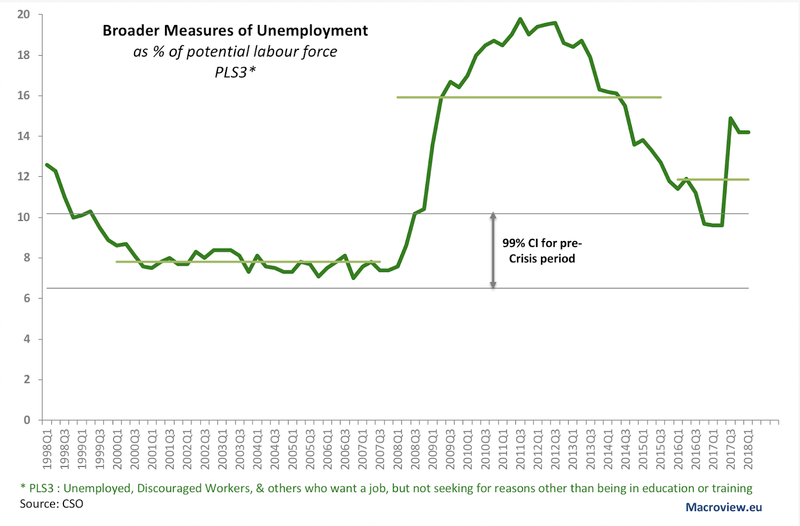 However, the CSO also reports the PLS2 measure of broader unemployment. The Above analysis was based on reported PLS1 data, covering unemployed plus discouraged workers, as a percentage of the labour force. Adding to the PLS1 those in potential additional labour force (basically able bodied adults who are neither employed nor unemployed, nor discouraged, and are not in studies or formal training), the CSO gets PLS2 measure of broader unemployment. In 1Q 208 this number read 10.2% of the Labour Force, plus Potential Additional Labour Force, which was statistically higher than the pre-Crisis average of 6.1% (falling into the 99% confidence interval range of (4.39%, 7.81%). In other words, the economy has not yet recovered from the Crisis based on PLS2 broader unemployment measure. Extending PLS2 to cover all unemployed, plus those who want a job and not seeking for reasons other than being in education or training, in 1Q 2018 the broader PLS3 unemployment measure stood at 14.2 percent, unchanged on 4Q 2017. As with PLS2, the 1Q 2018 reading for PLS3 falls well beyond the range of the pre-crisis historical average of 8.36% (with 99% confidence interval of (6.52%, 10.20%). As noted above, by two broader unemployment measures: PS2 and PLS3, Irish economy has not recovered from the crisis, even if we take a relatively benign recovery measure of the economy reaching the pre-crisis 1Q 1998 - 4Q 2007 average rate of unemployment. Worse, taking 4 year moving average and a 4 year rolling standard deviation in PS3 rates, 1Q 2018 PLS3 rate of 14.2% is closer to the upper margin of the 99% confidence interval for 1Q 2018 based on prior 4 years of data (the CI is given by (9.81%, 15.63%) range). Which means that 1Q 2018 data shows no statistically significant break-out from the PLS3 broader unemployment dynamics of the past 4 years. The same holds for the 5 years MA and rolling STDEV. So while the official unemployment readings are showing a very robust recovery, broader measures of unemployment continue to trend in line with the economy still carrying the hefty legacy of the recent crises. Based on the most current data for Irish employment and working hours, I have calculated the difference between the two key time series, the Full Time Equivalent employment (FTE employment) and the officially reported employment. Defining FTE employment, is used data on hours per week worked, using 40-44 hours category as the defining point for FTE. A note of caution, FTE is an estimated figures, based on mid-points of working time intervals reported by the CSO. Based on these definitions, in 1Q 2018, there were 2.2205 million people in official employment in Ireland. However, 51,800 of these worked on average between 1 and 9 hours per week, and another 147,300 worked between 10 and 19 hours per week. And so on. Adjusting for working hours differences, my estimated Full Time Equivalent number of employees in Ireland in 1Q 2018 stood at 1.94223 million, or 278,271 FTE employees less than the official employment statistics suggested. The gap between the FTE employment and officially reported number of employees was 12.53%. 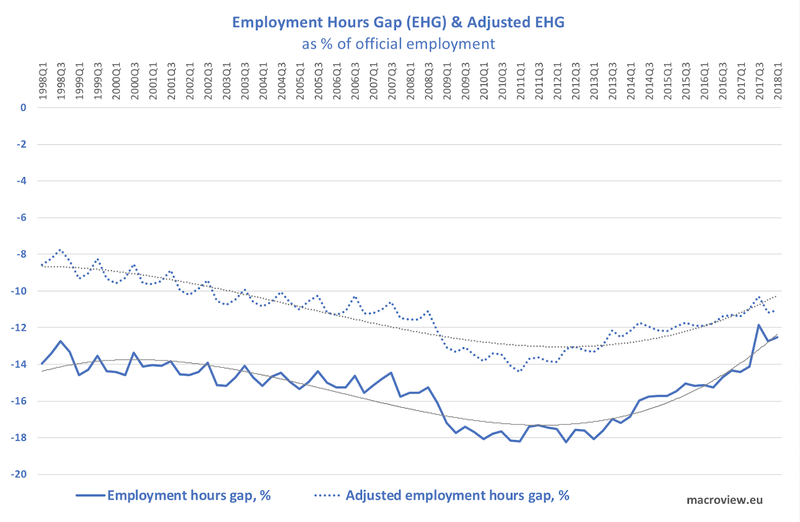 I defined the above gap as “Employment Hours Gap” (EHG): a percentage difference between those in FTE and those in official employment. 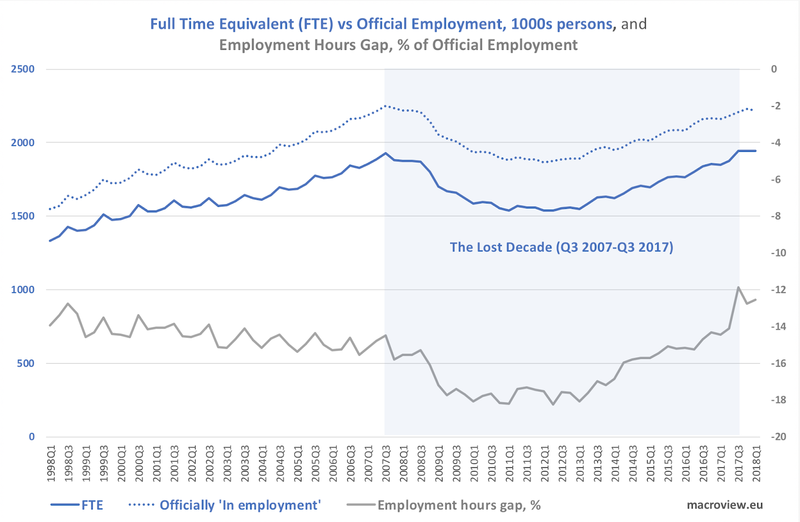 A negative gap close to zero implies FTE employment is close to the official employment, which indicates that only a small proportion of those in employment are working less then full-time hours. In terms of official employment numbers, Ireland’s economy has not fully recovered from the crisis. The pre-Crisis peak official employment stands at 2.2522 million in 3Q 2007. The bad news is: as of 1Q 2018, the same measure stands at 2.2205 million. In terms of FTE employment, the peak pre-Crisis levels of employment stood at 1.9261 million in 3Q 2017. This was regained in 3Q 2017 at 1.9444 million. So the good news is that the current recovery is at least complete now, after a full decade of misery, when it comes to estimated FTE employment. The improved quality of employment as reflected in better mix of FT and >FT employees in the total numbers employed, generated in the recent recovery, is highlighted in the chart as well, as the gap has been drawing closer to zero. 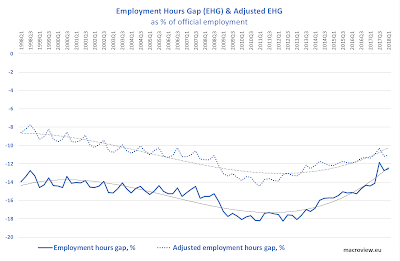 Per above, while the recovery has been associated with a modestly improving working hours conditions, it is now clear that excluding workers on Variable Hours’ put the current level of EHG still below the conditions prevailing in the early 2000s. More interestingly, we can see a persistent trend in terms of rising / worsening gap from the end of the 1990s through to the end of the pre-Crisis boom at the end of 2007, and into the collapse of the Irish economy through 2012. The post-Crisis improvement in Employment Hours Gap has been driven by the outflows of workers from the Variable Hours’ to other categories, but when one controls for this category of workers (a category that is effectively ‘catch-all-others’ for CSO) the improvements become less dramatic. Overall, FTE estimates indicate some problems remaining in the Irish economy when it comes to the dependency ratios. Many analysts gauge dependency ratios as a function of total population ratio to those in official employment. The problem, of course, is that the economic capacity of someone working close to 40 hours per week or above is not the same as that of someone working less than 20 hours per week. Note: More on dependency ratios next. Buried at the end of the report is this quote from Damon Wilson, the council’s executive vice president: "Every Latvian politician has worked with and knows us..." Which does lift the proverbial rug just a notch over the proverbial pile of history compiled underneath the Council: the organization has been a de facto go-to shop for framing politics of Eastern Europe. The real scandal, of course, is right there. Just imagine the screams from the media if a private initiative, say called Cambridge Analytica, uttered a similar statement in public? And yet, the AC can make such a statement in defence of its activities. Smell the salts? Transparency International recently released its annual Corruption Perceptions Index, a measure of the degree of public concerns with corruption, covering 180 countries. The Index is quite revealing. Not a single large economy is represented in the top 10 countries in terms of low perceptions of corruption. Worse, for a whole range of the much ‘talked about’ tax havens and tax optimising states, corruption seems to be not a problem. Switzerland ranks 3rd in the world in public perceptions of corruption, Luxembourg ranks 8th, along with the Netherlands, and the world’s leading ‘financial secrecy’ jurisdictions, the UK. Hong Kong is ranked 13th. Ireland is in a relatively poor spot at 19th place. American exceptionalism, meanwhile, continues to shine. The U.S. occupies a mediocre (for its anti-corruption rhetoric and the chest-thumping pursuits of corrupt regimes around the world) 16th place in the Corruption Perception Index, just one place above Ireland, and in the same place as Belgium and Austria (the former being a well-known centre for business corruption, while the latter sports highly secretive and creative, when it comes to attracting foreign cash, financial system). UAE (21st), Uruguay (23rd), Barbados (25th), Bhutan (26th) and more, are within the statistical confidence interval of the U.S. score. And consider Europe. 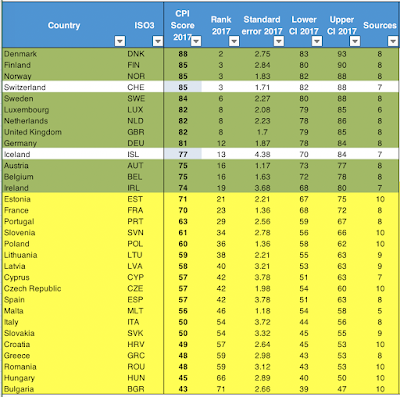 While most of the Nordic and ‘Germanic’ Europe, plus the UK and Ireland, are in top 20, the rest of the EU rank below the U.S. All non-EU Western European countries, meanwhile, are in the top 15. - The U.S. performance in terms of corruption remains effectively poor. The country scored 73 on CPI in 2012-2013, and since then, the score roughy remained bounded between 74 and 75. Ireland, however, managed to improve significantly, relative to the past. 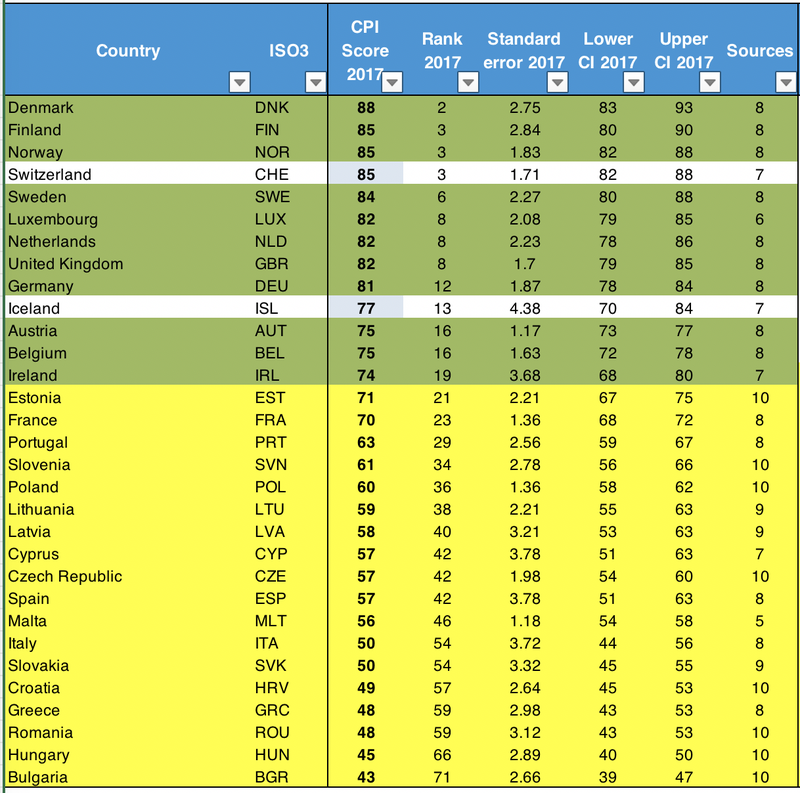 In 2012, Irish CPI score was 69. Since then, it rose to a peak of 75 in 2015 and is currently standing at 74. So in terms of both 2012 to peak, and peak to 2017 dynamics, Ireland is doing reasonably well, even though we are still suffering from the low starting base. Hey, anyone heard of any corruption convictions at the Four Courts recently? No burden-sharing mechanism has been deployed during the European recovery period anywhere. In other words, both, Greece and Europe at large are enjoying an ongoing recovery that has been underpinned by reforms, not by burden-sharing arrangements of any sort. The above has happened during the extended period of asymmetric and massive-scale burden-sharing carried out by the ECB via its QE (Greece received no QE benefits, while the rest of the Euro area enjoys huge fiscal support subsidies from Frankfurt). 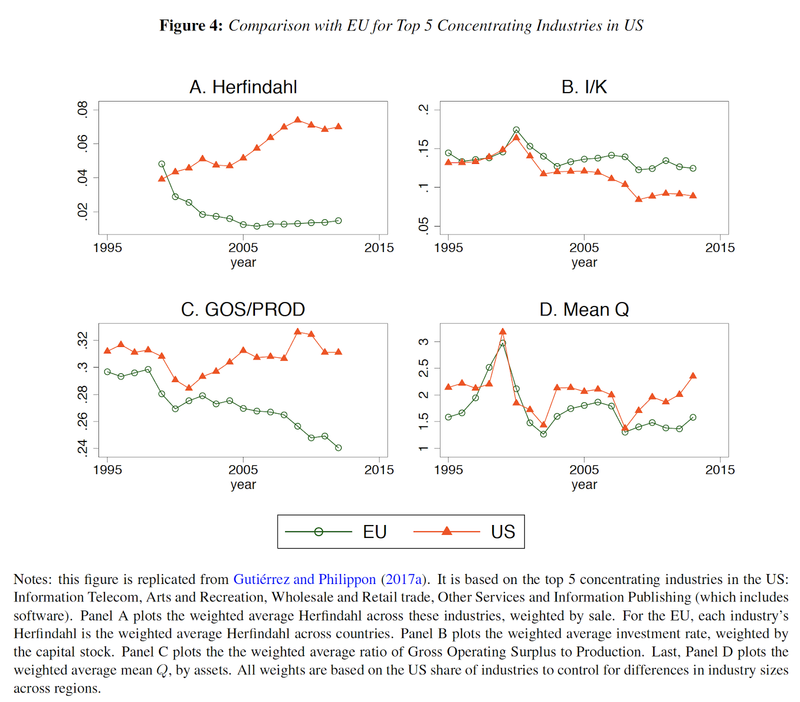 “Figure 1 illustrates these facts by showing that profit rates and concentration measures have increased in the US yet remained stable in Europe. 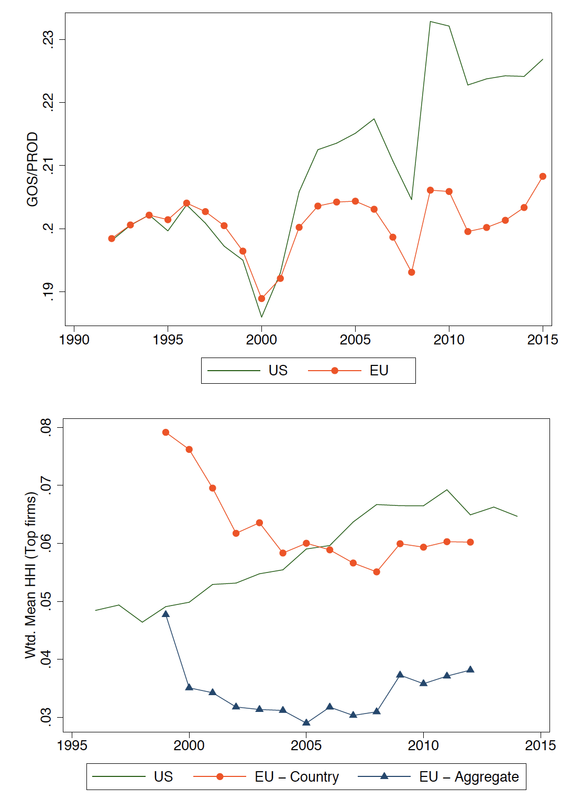 In addition, note that the U.S the increased integration among EU economies essentially shifts the appropriate measure of concentration from the red dotted line towards the blue line with triangles – which further strengthens the trend." So, in summary, today, “European markets have lower concentration, lower excess profits, and lower regulatory barriers to entry.” even looking at specific industries “with significant increases in concentration in the U.S., such as Telecom and Airlines, and show that these same industries have not experienced similar evolutions in Europe, even though they use the same technology and are exposed to the same foreign competition” (see chart below). Gutiérrez and Philippon (2018) argue that politicians care about consumer welfare but also enjoy retaining control over industrial policy. We show that politicians from different countries who set up a common regulator will make it more independent and more pro-competition than the national ones it replaces.” In other words, once politicians surrender control to a multinational institution (e.g. the EU or ‘Brussels’ or, in the case of Switzerland, to the umbrella-type Federal Government), they tend to favour such new institutional arrangement to be more independent from national politics. 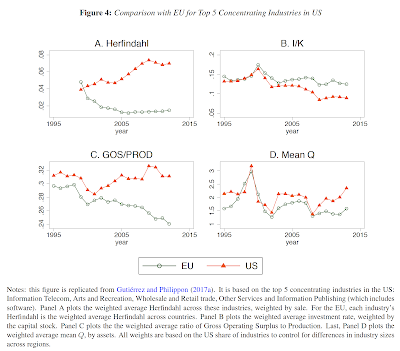 Hence, as Gutiérrez and Philippon (2018) more, “European institutions are more independent than their American counterparts, and they enforce pro-competition policies more strongly than any individual country ever did. Countries with ex-ante weak institutions benefit more from the delegation of antitrust enforcement to the EU level. “ These dynamics are reflected in the switch from the ’average of the nation states’ red dotted line in the chart above, toward a unified EU-wide measure reflected by the blue line. 2. US firms spend more on lobbying US politicians and regulators than EU firms. 3. 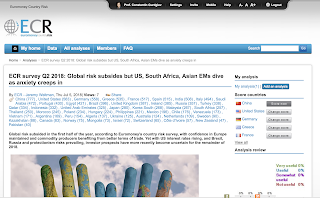 Countries with weaker ex-ante institutions benefit more from supra-national regulation. So, put simply, part of the increasing market concentration and power in the U.S. can be explained by the tangible politicization of the American regulatory environment. Of course, as noted in my own posts on the subject (see link above), this political channel for monopolization reinforces industry structure channel (ICT ‘disruption’ channel) and other channels that support increased market power for dominant firms. All of this, taken together, means one thing: the U.S. is falling dangerously behind in terms of the degree of its economy openness to challengers to the dominant firms, resulting in barriers to entrepreneurs, innovators and smaller enterprises. The costs of this ‘Google Syndrome’ are mounting, ranging from depressed wages, to jobs insecurity, to lack of investment and productivity growth, to growing voters unease with the status quo. The premise of the Free Markets America no longer holds. 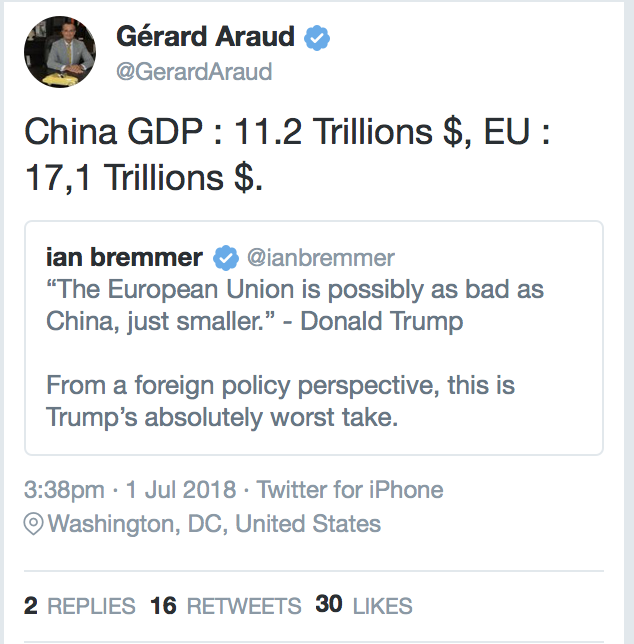 Worse, Social(list) Europe is now beating the U.S. in its own game. 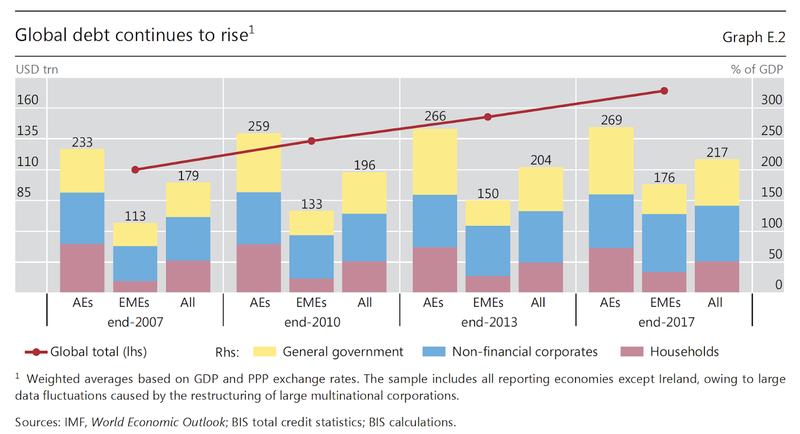 Bank for International Settlements Annual Report for 2018 has a very interesting set of charts covering the growing global debt bubble, one of the key risks to the global economy highlighted in the report. Global debt rose from 179% of GDP at the end of 2007 to 217% at the end of 2017 - adding 38 percentage points to the overall leverage carried by the global economy. The rise has been more dramatic for the Emerging Economies, with debt levels rising from 113% of GDP to 176% between the end of 2007 and the end of 2017, a net addition of 63 percentage points. Advanced economies faired somewhat better, posting an increase from 233% of GDP to 269%, a net rise of 36 percentage points. As it stood at the end of 2017, Global Debt was well in excess of x3 the Global GDP - a degree of leverage not seen in the modern history. As noted by BIS: “...financial markets are overstretched, as noted above, and we have seen a continuous rise in the global stock of debt, private plus public, in relation to GDP. 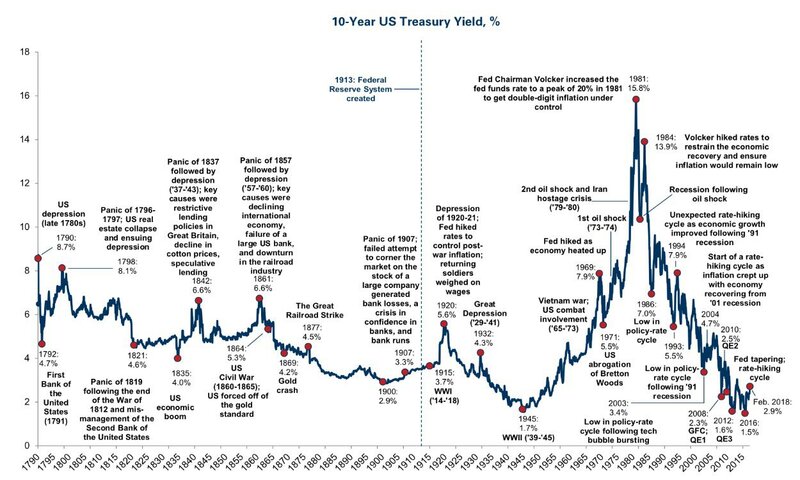 This has extended a trend that goes back to well before the crisis and that has coincided with a long-term decline in interest rates". As the Central Banks embark on gradual, well-flagged in advance and 'orderly' overall rates and asset purchases 'normalization', the global economy is likely to bifurcate, based on individual countries debt exposures. As the chart above shows, impact from a modest, 100bps hike in rates, will be relatively significant for all economies, with greater impact on highly indebted countries. 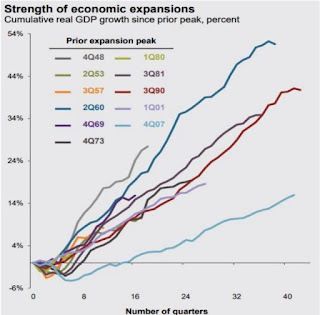 Per BIS: "Since the mid-1980s, unsustainable economic expansions appear to have manifested themselves mainly in the shape of unsustainable increases in debt and asset prices. Thus, even in the absence of any near-term market disruptions, keeping interest rates too low for too long could raise financial and macroeconomic risks further down the road. In particular, there are reasons to believe that the downward trend in real rates and the upward trend in debt over the past two decades are related and even mutually reinforcing. True, lower equilibrium interest rates may have increased the sustainable level of debt. But, by reducing the cost of credit, they also actively encourage debt accumulation. 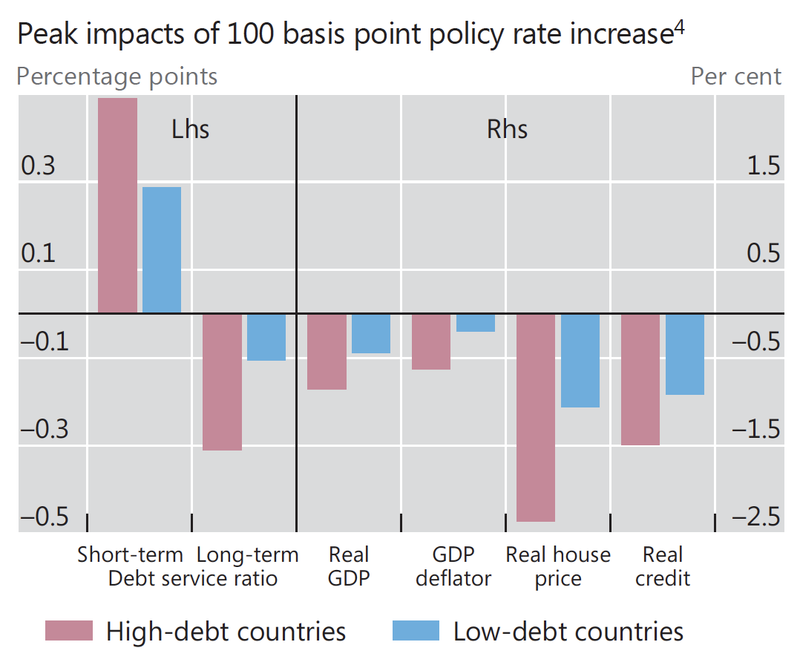 In turn, high debt levels make it harder to raise interest rates, as asset markets and the economy become more interest rate-sensitive – a kind of “debt trap”." Thus, the impetus for rates and monetary policies normalisation is the threat of continued debt bubble inflation, but the cost of such normalisation is the deflation of the debt bubble already present. In other words, there's an elephant and here's the china shop. "A further complication in calibrating normalisation relates to the need to build policy buffers for the next downturn. Indeed, the room for policy manoeuvre is much narrower than it was before the crisis: policy rates are substantially lower and balance sheets much larger". And here's the mouse: cyclically, we are nearing the turning point in the current expansion. 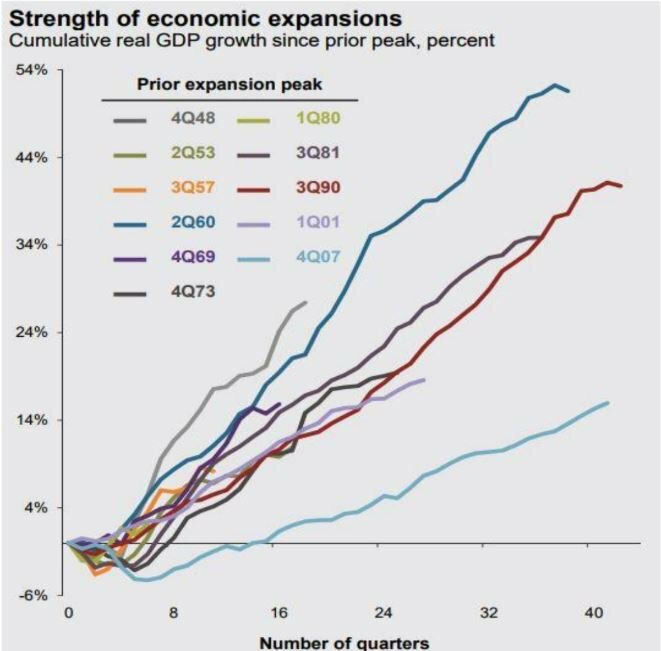 And despite all the PR releases about the 'robust recovery' current up-cycle in the global economy has been associated with lower growth rates, lower productivity growth, lower real investment (as opposed to financial flows), and more debt than equity (see http://trueeconomics.blogspot.com/2018/07/14718-second-longest-recovery.html). 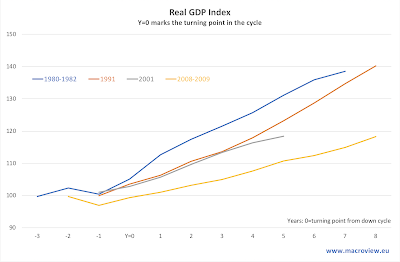 The fact that the current recovery cycle has been weak is only one part of the story, however, that would be less worrying if not for the second part. 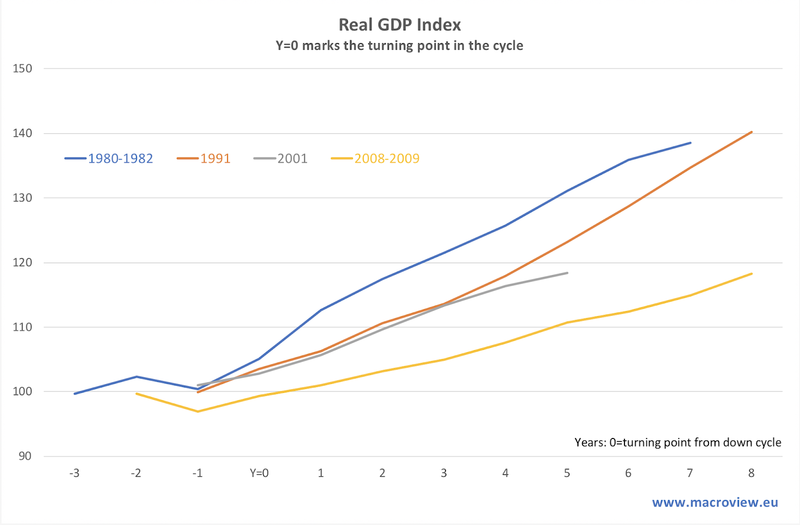 Namely, that almost every successive recovery cycle in the past three decades has been weaker than the previous one. 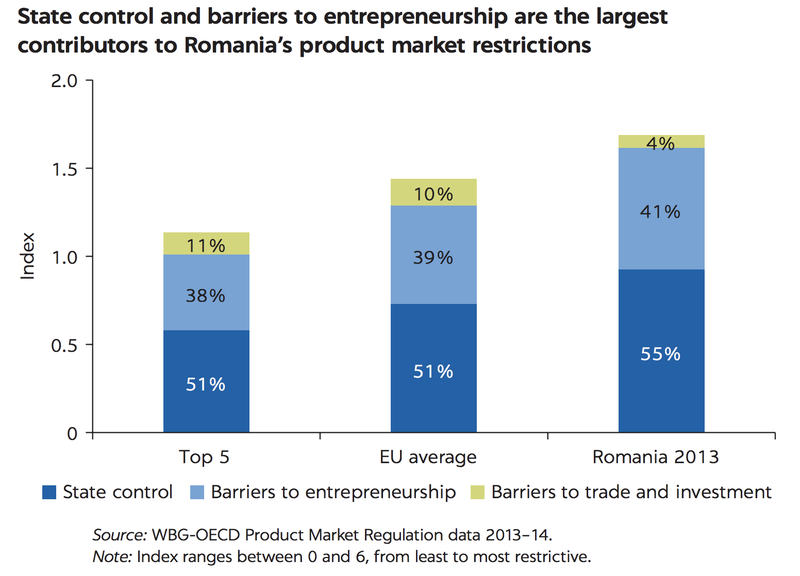 I have posted about the new World Bank report on Romania's uneven convergence experience in the previous post (here). 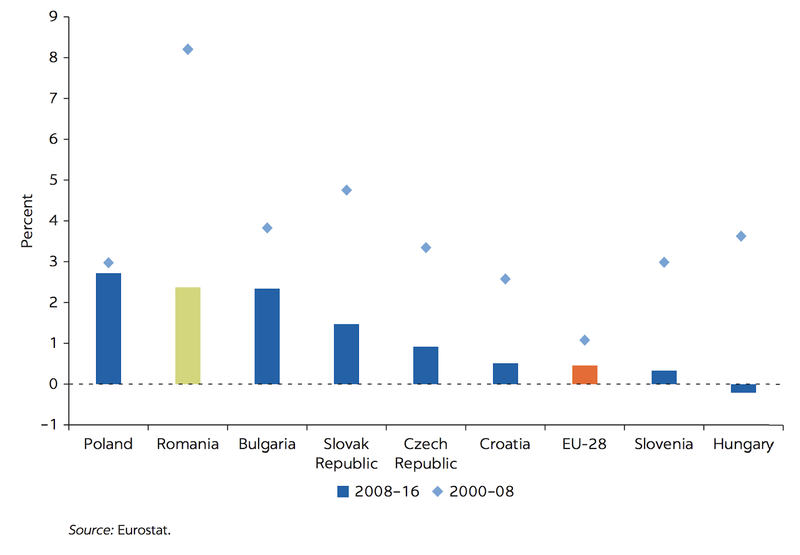 One interesting chart in the report shows comparatives in labour productivity growth across a range of the Central European economies since the Global Financial Crisis. The chart is striking! All economies, save Poland - the 'dynamic Tigers of CEE' prior to the crisis - have posted marked declines in labour productivity growth, as did the EU28 as a whole. 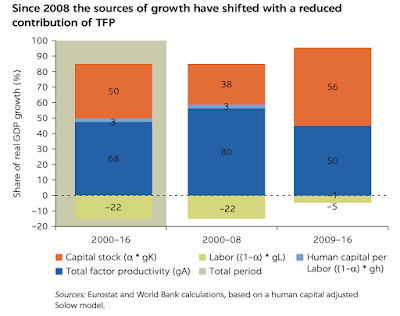 When one recognises the fact 2008-2016 period includes dramatic losses in employment, rise in unemployment and exits from the labour force during the period of the GFC, and the subsequent Euro Area Sovereign Debt Crisis - all of which have supported labour productivity to the upside - the losses in productivity growth would be even more pronounced. But the problem is worse than simple tertiary education figures suggest. 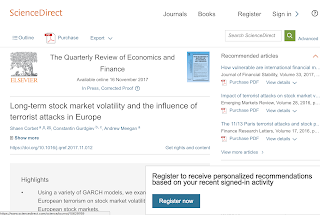 Current trends in technological innovation stress data intensity, AI and full autonomy of technological systems from labour and human capital. 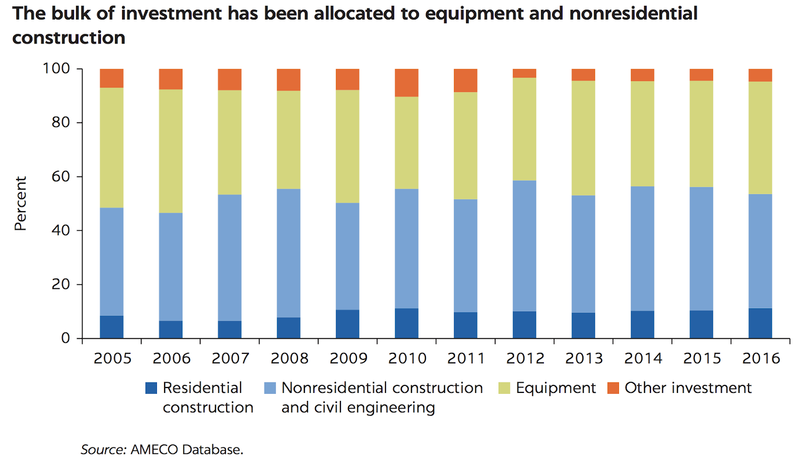 Which implies that even educated and skilled workforce is no longer a buffer to displacement. These three factors contribute to an expanding army of voters who are marginalised within the system. Romania is a canary in the European secular stagnation mine. 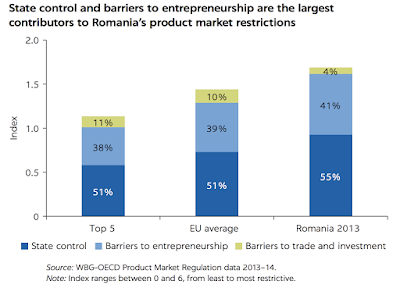 "From Uneven Growth to Inclusive Development : Romania's Path to Shared Prosperity" https://openknowledge.worldbank.org/handle/10986/29864. "Romania’s transformation has been a tale of two Romanias: one urban, dynamic, and integrated with the EU; the other rural, poor, and isolated." 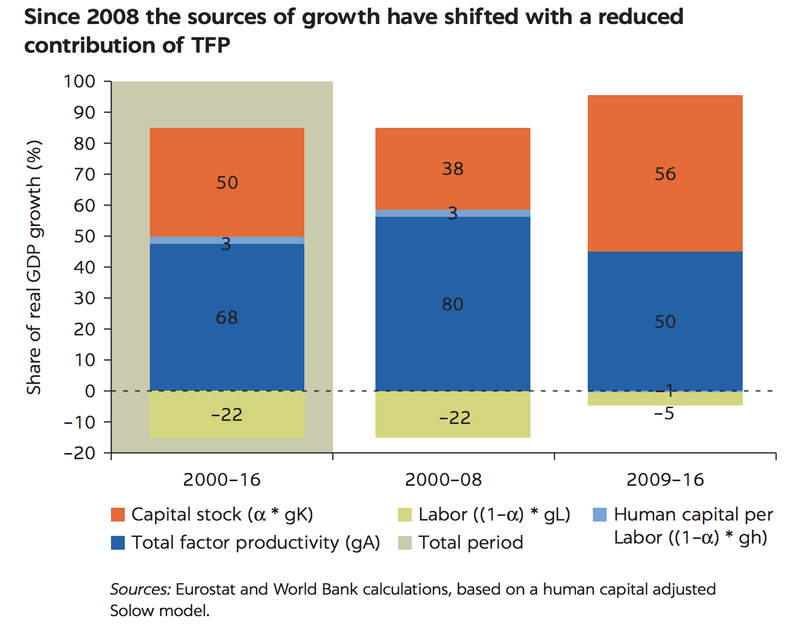 "Reforms spurred by EU accession boosted productivity ...GDP per capita rose from 30 percent of the EU average in 1995 to 59 percent in 2016." "Today, more than 70 percent of the country’s exports go to the EU, and their technological complexity is increasing rapidly... the gross value added of the information and communications technology (ICT) sector in GDP, at 5.9 percent in 2016, is among the highest in the EU." 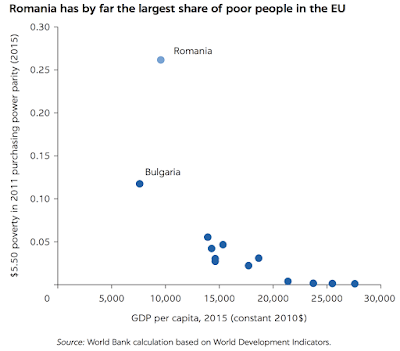 "Yet Romania remains the country in the Union with by far the largest share of poor people, when measured by the $5.50 per day poverty line (2011 purchasing power parity)". 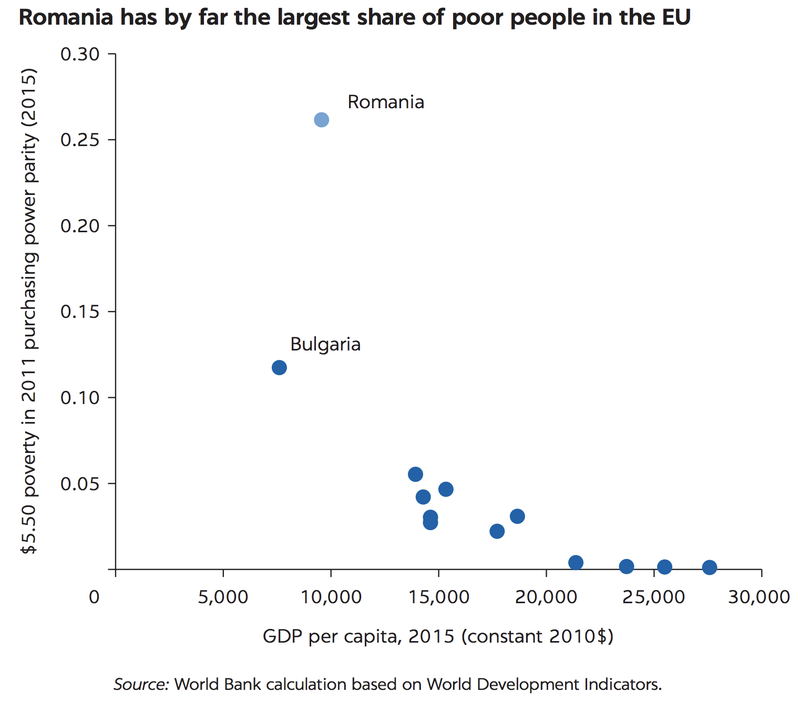 More than 26% of country population lives below that poverty line, "more than double the rate of Bulgaria (12%)." "While Bucharest has already exceeded the EU average income per capita and many secondary cities are becoming hubs of prosperity and innovation, Romania remains one of the least urbanized countries in the EU, with only 55 percent of people living in cities." "Overall, access to public services remains constrained for many citizens, particularly in rural areas, and there is a large infrastructure gap, which is a drag on the international competitiveness of the more dynamic Romania and limits economic opportunities for the other Romania in lagging and rural areas." "Romania was invited to open negotiations with the EU in December 1999. Until Romania joined in January 2007, EU accession remained an anchor for reforms, providing momentum for the privatization and restructuring of SOEs and for regulatory and judiciary reforms." "Output gradually recovered, and until 2008 the country enjoyed high but volatile growth... Unemployment was on a declining trend, but youth and long-term unemployment remained elevated. 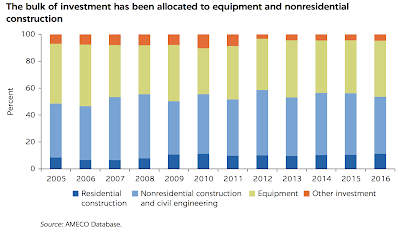 Skills and labor shortages became increasingly widespread. High inactivity persisted stubbornly, particularly among women. Gains in labor force participation were modest overall. ...Inequality increased further, as large categories of people—the Roma in particular—continued to be excluded from the benefits of growth." "Although output has recovered since 2008, institutional shortcomings have compounded the effects of the crisis, contributing to significant setbacks in poverty reduction, and are again leading to macroeconomic imbalances." "Fiscal consolidation during 2009–2015 has helped place economic growth on a strong footing. However, lack of commitment and underfunding for the delivery of public services and poor targeting of social programs have contributed to the negative income growth of the bottom 40 percent of the income distribution (the so-called bottom 40) in 2009–2015, with poverty remaining above pre-crisis levels, and inequality still among the highest in the EU." Euromoney Country Risk quarterly survey is out, covering trends in sovereign risk for 1H 2018. With comments from myself, amongst others. Reuters reported (https://www.reuters.com/article/russia-banks/russian-c-bank-says-to-deposit-2-8-bln-at-otkritie-trust-and-rost-idUSR4N1TT00E) on Central Bank of Russia (CBR) setting up a 'bad bank' to resolve non-performing assets in three medium- large-sized banks that CBR controls. In 2016, the CBR took over control over three medium- large-sized banks, Otkritie, B&N Bank and Promsvyazbank. Last month, the CBR announced an injection of RB 42.7 billion of funds to recapitalise Otkritie with funds earmarked to cover losses in Otkritie's pension fund. Most Bank received RB37.1 billion in new capital. The CBR also deposited RB 174.2 billion (USD2.78 billion) in three banks (RB63.3 billion of which went to Otkritie) on a 3-5 years termed deposit basis. The funds will be used to reorganise banks operations and shift non-performing and high risk assets to a Trust Bank-based 'bad bank' which will operate as an asset management company. After divesting bad loans, Otkritie is expected to be sold back to private investors. CBR's total exposure to troubled banks is now at RB 227 billion (USD3.5 billion), with CBR having spent RB 760 billion (USD 12 billion) on its overall campaign to recapitalise troubled lenders. CBR holds RB 1.3 trillion (USD30 billion) on deposit with lenders it controls. As BOFIT note: "...the CBR to date has used over 45 billion USD (about 3% of 2017 GDP) in supporting the three banks that it took over last year. Some of this amount, however, should be recovered when assets in banks acquired by the CBR are sold off as well as in the planned privatisations of the banks." At the beginning of June, Otkritie stated that the bank aims to float a 15-20% stake in 2021. The bank said t's target for pricing will be "at least 1.3 times the capital the bank has at the end of 2020". Otkritie targets return on equity of 18% in 2020, and so far, in the first five months of 2018, the bank made RB 5.4 billion in net profit, per CBR. 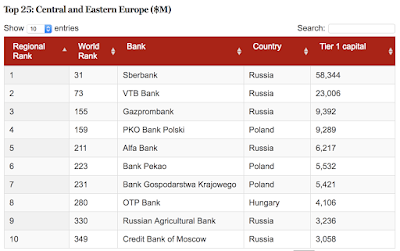 Otkritie ranked sixth largest bank in Central and Eastern Europe by capitalisation by The Banker in 2017 prior to nationalisation. Following nationalisation, Otkritie ranked 16th in CEE, having lost some USD2.4 billion in capital. Another lender, Sovetsky bank from Saint Petersburg lost its license on July 3. The bank gas been in trouble since February 2012 when the CBR approved its first plans for restructuring. 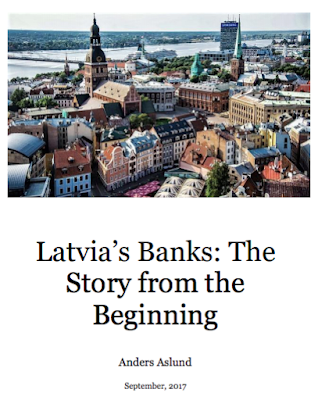 In February 2018, the bank was in a "temporary administration" through the Banking Sector Consolidation Fund. The latest rumours suggest that Sovetsky deposits and loans assets will retransferred to another lender. Sovetsky was under original administration by another lender, Tatfondbank, from March 2016, until Tatfondbank collapsed in March 2017 (official CBR statement https://www.cbr.ru/eng/press/PR/?file=03032017_105120eng2017-03-03T10_47_12.htm, and see this account of criminal activity at the Tatfondbank: https://en.crimerussia.com/financialcrimes/collapse-of-tatfondbank-robert-musin-siphoned-off-funds-from-state-owned-bank/ and https://en.crimerussia.com/financialcrimes/tatfondbank-officially-collapses/). 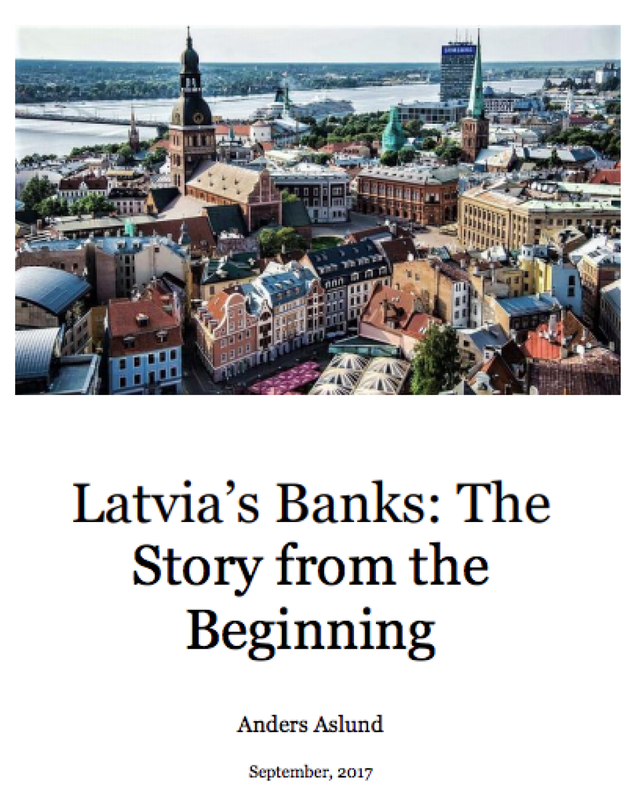 Tatfondbank's tangible connection to Ireland's IFSC was covered here: https://realnoevremya.com/articles/1292-tatfondbank-raised-60-million-via-obscure-irish-company-just-before-collapse. Overall, CBR have done as good a job of trying to clean up Russian banking sector mess, as feasible, with criminal proceedings underway against a range of former investors and executives. The cost of the CBR-led resolution and restructuring actions has been rather hefty, but the overall outrun has been some moderate strengthening of the sector, hampered by the tough trading conditions for Russian banking sector as a whole. 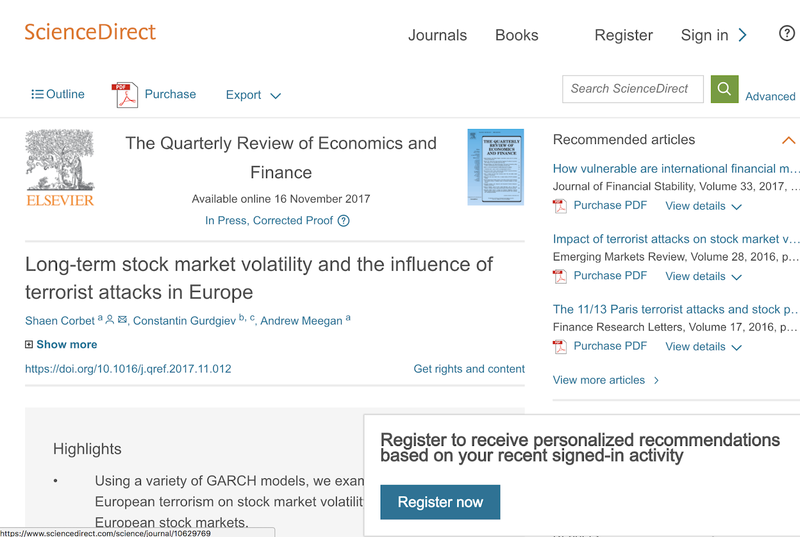 A range of U.S. and European sanctions against Russian financial institutions and, more importantly, constant threat of more sanctions to come have led to higher funding costs, more acute risks profiles, lack of international assets diversification, and even payments problems, all of which reduce the banking sector ability to recover low quality and non-performing assets. The CBR has zero control over these factors. 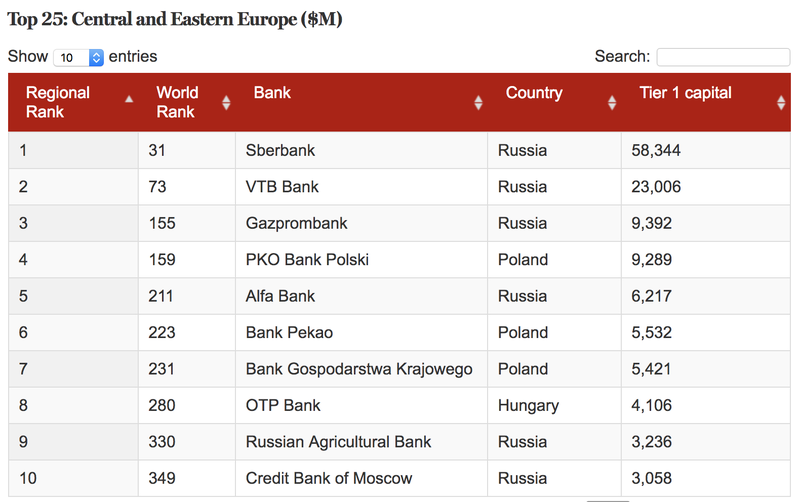 These banks are systemic to the Russian economy, and only the U.S. sabre rattling is holding them back from being systemic in the broader CEE region. This is a shame, because opening up a banking channel to Russian economy greater integration into the global financial flows is a much more important bet on the future of democratisation and normalisation in Russia than any sanctions Washington can dream up. As an aside, new developments in the now infamous Danske Bank case of laundering 'blood money' from Russia, relating to the Magnitzky case were reported this week in the EUObserver: https://euobserver.com/foreign/142286. 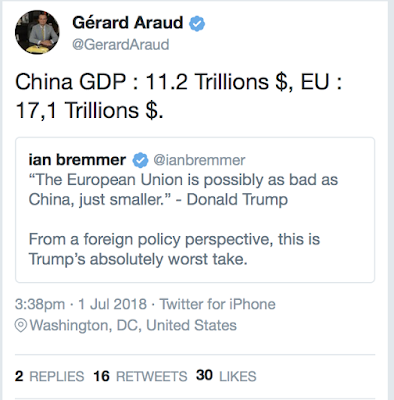 Yesterday, President Trump has suggested that the WTO is treating the U.S. "very badly"
In the previous post, I also shown that the U.S. contributes disproportionately less than the EU and China to WTO budget: http://trueeconomics.blogspot.com/2018/07/3718-china-eu-and-us-arch-stantons-grave.html. In fact, back in October 2017, President Trump claimed that: Trump, Oct. 25: "The WTO, World Trade Organization, was set up for the benefit for everybody but us. They have taken advantage of this country like you wouldn’t believe. And I say to my people, you tell them, like as an example, we lose the lawsuits, almost all of the lawsuits in the WTO — within the WTO. Because we have fewer judges than other countries. It’s set up as you can’t win. In other words, the panels are set up so that we don’t have majorities. 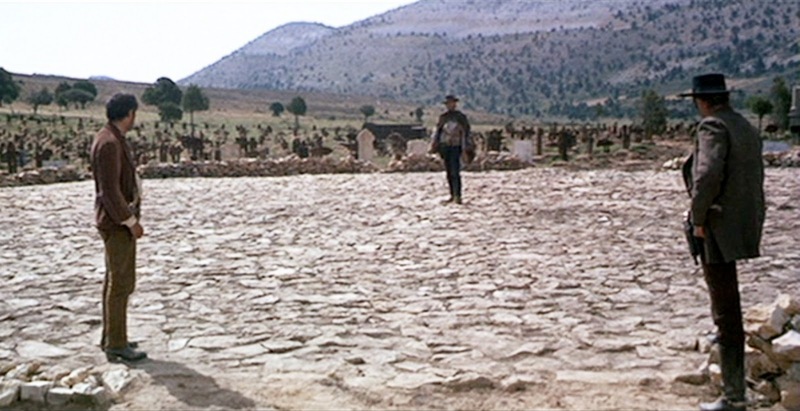 It was set up for the benefit of taking advantage of the United States." 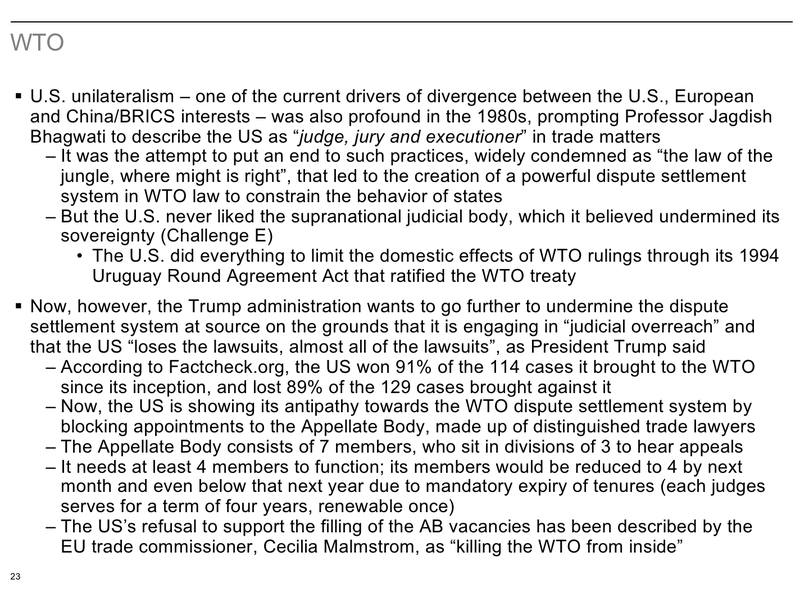 WTO dispute resolution rules require that none of the panelists on each 3-person panel hearing disputes cases can be from the country involved in a dispute (per Article 8: https://www.wto.org/english/docs_e/legal_e/28-dsu_e.htm). In other words, the number of experts from any particular country that are available to serve on dispute resolution panels is immaterial to the experts service in the U.S. dispute cases. In reality, thus, the U.S. loses slightly fewer cases brought against it, than it wins cases brought against other nations by it. 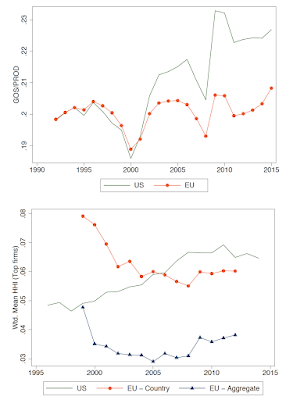 The high rates of U.S. losses and wins are fully comparable with those of other advanced economies and reflect, in fact, not some WTO bias against any given nation, but rather the simple fact that majority of nations, including the U.S. tend to bring to the WTO arbitration only such cases where concerns raised are well-founded and researched. 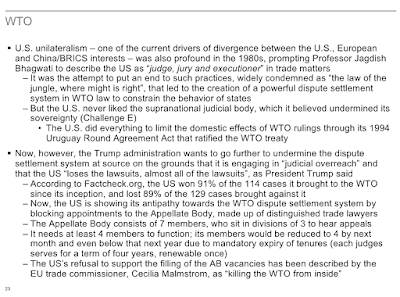 Which, in effect, means that the WTO dispute resolutions system (slow as it might be) is effective at restricting the number of frivolous cases being brought to resolution, aka, a good thing. Much of the above evidence does not just come from my own arguments alone. Here is an intelligent and pro-trade set of arguments about why the U.S. claims of unfair treatment under the WTO regime are not only wrong, but actually conceal the much less pleasant protectionist reality of the Washington's policies: https://www.forbes.com/sites/danikenson/2017/03/09/u-s-trade-laws-and-the-sovereignty-canard/2/#657177747edc.